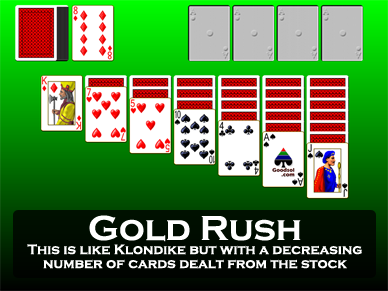 Click on the screen shot of the game Gold Rush from Pretty Good Solitaire to download the 30 day free trial version. 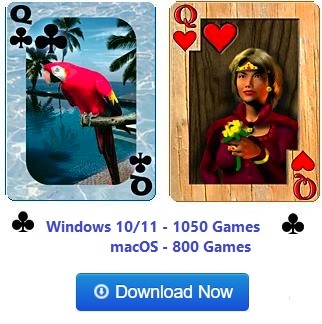 Klondike is one of the most popular of solitaire games and the game that is often generically called solitaire, as in the solitaire game that comes with Windows. I have to tell you, though, that I've never been a big fan of Klondike. There aren't that many move options most of the time, and depending on how the rules are set it is usually either too hard to win or too easy. There isn't a form of Klondike that I've felt is just right. Gold Rush is a game that comes about as close as anything I've seen to making Klondike interesting to me. 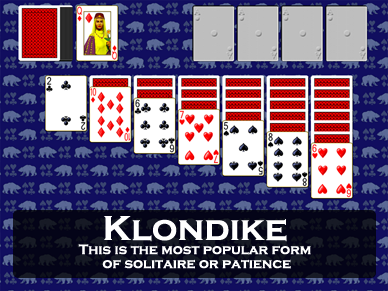 It is a simple variation of Klondike. My version of Gold Rush in Pretty Good Solitaire allows you to play offline, full screen, with complete undo and my unique right click quick move. It's the best way to play solitaire! Gold Rush for Windows 10 or Mac! In this video I explain how to play Gold Rush. Download Gold Rush Now and play along! The cards are dealt out exactly as in Klondike, with 7 piles, one card in the first pile, 2 in the 2nd, and so on, with only the top card face up. The rest of the cards form the stock, and the objective is to move all the cards to the foundations up by suit as usual. The tableau is built down by alternate color and only Kings can be played to spaces. This is all exactly the same as in Klondike. Gold Rush is different in how the cards are dealt from the stock to the waste. The first time through the stock, the cards are turned over 3 at a time to the waste. But the second time through the stock, the cards are turned over only 2 cards at a time. And finally on the third and last time through the stock, the remaining cards are turned over 1 card at a time. After that, the game is over. The effect of this is that some cards are unavailable in the waste as happens when Klondike is played with the 3 card rule, but eventually all the cards will show up in the last time through the deck. This stops the game from getting blocked as can happen in 3 card Klondike. You basically get the best of both worlds between the 1 card and 3 card Klondike rules. These rules make Gold Rush possible to win regularly, but not so easy that you can win every time. It seems that Gold Rush can be won about 20% of the time, which is a good win rate that is not too easy or too hard.